talking on cell phones, texting, following too closely, or otherwise not following safe driving practices. Based on 2012 motor vehicle data from the U.S. Consumer Product Safety Commission and the Centers for Disease Control and Prevention (CDC), more than 2.5 million adult drivers and passengers were treated in emergency departments after being injured in a motor vehicle crash. Of those treated, over 164,000, or about 52 out of every 100,000 people in the country are hospitalized each year as a result of a serious injury. While this number has dropped dramatically over the last twenty years the cost of a serious injury continues to have a dramatic impact on families and on society as a whole. In 2003 the CDC determined the economic costs over a lifetime for an individual with a severe impairment to be approximately $1 million. Since that time, the cost of health care has risen dramatically. These costs can have a devastating effect on a family. There are many definitions for the word “disability”, from restrictive definitions that allow access to certain services or government provided entitlements, to broad definitions that are more reflective of the impact that disability has on society. The United States Census Bureau uses a definition for disability that includes impairments, activity limitations, and factors that restrict participation. Disability is categorized into three broad domains: communicative, mental and physical. 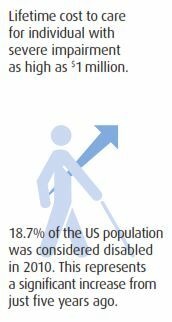 Significantly, 56.7 million people (18.7% of the population) were considered disabled in 2010, and of those about two-thirds (12.6% of the population) were considered severely disabled. This is a significant increase from only five years earlier. The Administration on Aging, a department of Health & Human Services, estimates that the U.S. population is aging quickly. People age 65 and over represented 12.4% of the population in 2000. By 2030, as much as 19% of the population will be age 65 and over. This represents a doubling of the senior population during this 30 year time span. 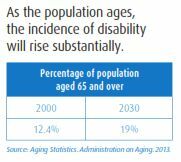 With the population aging, the incidence of disability will rise substantially. The chart above from the United States Census Bureau shows how the prevalence of disability increases as the population ages. The most frequently cited contributing causes of disability as the population ages are loss of hearing, mobility and memory. Whether caused by accident or illness, disability can be financially catastrophic for a family. 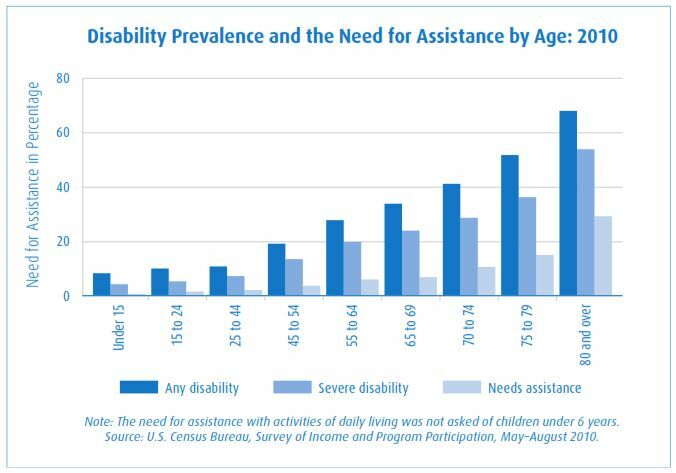 One notable statistic from the Social Security Administration estimates that just over 1 in 4 of today’s 20 year-olds will become disabled before the age of 67. Planning for the possibility of disability should be an important consideration in any financial plan; however many people are financially unprepared. As an example of the financial impact of disability, consider a couple whose financial plan is significantly impacted by a suddenly occurring disability that stops the husband from working at the age of 55. This would be a full 10 years before the couple’s planned retirement. 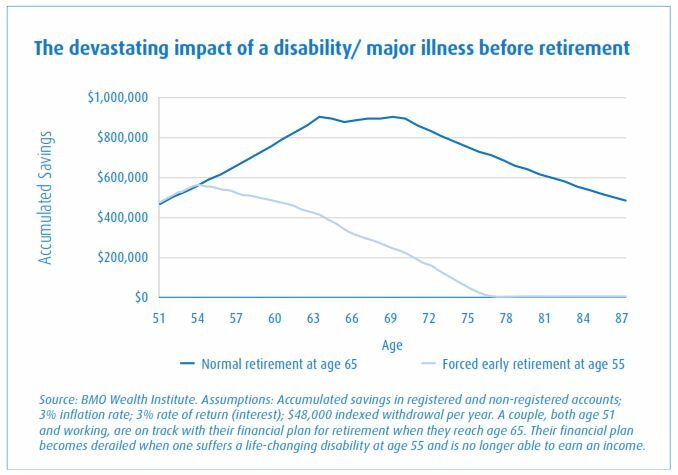 The combination of reduced income and increased spending to deal with the disability can overturn a financial plan that had been on track to last until at least the age of 90 to one where all of the couple’s savings would be exhausted by the age of 77. By comparison, if the couple had sufficient disability insurance coverage – through an employer plan or purchased personally – the financial damage could have been greatly reduced. The cost of a disability insurance policy varies widely depending on personal circumstances, age and the length of the elimination period chosen. 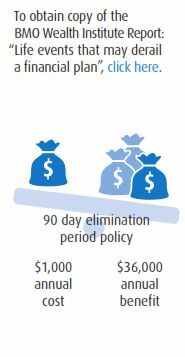 A policy with a 90 day elimination period that would provide a monthly benefit of $3,000 may only cost about $85 per month, or about $1,000 per year. Employers have important social and legal responsibilities that to accommodate both workers with disabilities and their employees who have responsibilities to care for loved ones with serious health concerns. Workers with a disability are more likely to have only part time work (33%) as compared to workers who have no disability (19%). Part-time employment reduces the income level that workers with a disability are able to earn. According to a 2012 report by the Bureau of Labor Statistics barriers to employment for persons with a disability include a lack of education or training, lack of transportation to the workplace, and the physical environment of the workplace. The cost of disability in the U.S. is considerable. For example, absenteeism to provide care for a disabled relative negatively impacts the American economy at a rate of 2.8 million workdays each year, costing employers more than $74 billion annually. These costs include decreased productivity and output, lost sales, and reduced customer service. The high cost of disability can be a large burden for many families. Fortunately there are a large number of programs, services and other opportunities available to help. Areas where help will be most beneficial include tax deductions, social benefits, financial support, and assistance with day-to-day living. In looking for assistance, individuals with disabilities and their caregivers look not only towards their governments, but also towards the businesses with which they interact on a regular basis. Businesses can make their premises easier to access through the use of ramps, powered doors, removal of physical obstacles that make visiting more challenging, and by offering better access to other consumer friendly interactive devices. Consumer friendly packaging and instructions that are easier to use by persons with disabilities is also important. The government supports businesses in helping make their workplaces accessible for clients and employees, through programs such as the Disability Access Credit which helps lower taxes for small businesseson eligible expenditures. Federal and state governments have a wide variety of programs in place to help individuals with disabilities with both their financial and service needs. Income support is provided in many ways by the government. These are some of the federal programs available to individuals with disabilities. These benefits are limited to individuals who cannot work because they have a medical condition that is expected to last for at least one year or result in death. Qualification also requires meeting the “recent work test” and a “duration of work” test. Partial disability and short-term disability situations are not covered under Social Security Disability Insurance. Benefit amounts are calculated using a complex formula that includes how much has been paid in Social Security taxes over a period of years. The average monthly benefit paid in 2013 was slightly over $1,000 per month. For these reasons personal disability insurance coverage is important, in order to make up for any gaps in coverage from the Social Security Disability Benefits. Payments under this program are made to people with low income who have limited resources, and are at least age 65 or are blind or have a disability. The basic federal amount of Supplemental Security Income is consistent nationwide, and many states add additional amounts to top up the benefit. For 2014, the monthly maximum federal amount is $721 for eligible individuals, and $1,082 for eligible individuals with an eligible spouse. There are a number of programs available specifically for veterans which include: support from the Veterans Administration to pay for adaptive equipment, transportation, financial assistance and services for family caregivers, clothing allowances, and outreach to meet the employment needs of disabled veterans. Other Programs: Support for individuals with disabilities is also available to help meet many other needs including: education, training, career assistance, health and medical, counseling, taxes, housing and assistance with daily living. 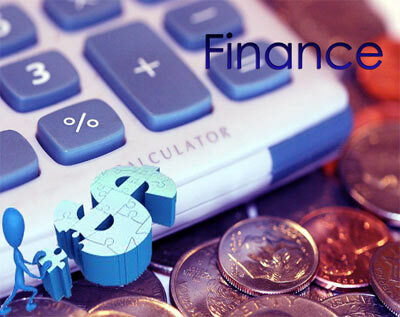 These tools, together with a well constructed financial plan, can provide the greatest financial benefit for both individuals with disabilities and their caregivers. Special trusts can be set up to provide benefits for people with disabilities and at the same time protect the assets in the trust. Designing the trust to ensure that it is compliant with U.S. laws, the disabled beneficiary will still be able to receive government supported health and care benefits under their publically assisted programs such as Medicaid. Having a Will and effective powers of attorney are two critical components of an effective financial and estate plan. A Will can help to ensure that financial and personal assets are passed to the most appropriate people. Similarly, having a power of attorney in place will provide the authority for a trusted individual to act, should it become necessary, with respect to personal property. A separate power of attorney should also be created to deal with personal care needs and medical issues. The person you chose to be your health care agent will have the authority to make life and death decisions on your behalf according the guidance you provide. The right time to make decisions Having Wills and powers of attorney in place is of significant importance when planning for possible incapacity highlighted in an April 2012 report titled “Estate planning in the 21st century: New considerations in a changing society” from the BMO Wealth Institute. The report highlights the importance of estate planning; which includes considerations such as preparing powers of attorney, updating a Will, and ensuring that older relatives, especially those that depend on caregivers are provided for. Life insurance is a financial tool that can be used to improve a family’s financial well-being. This is especially the case when life insurance is in place to assist with the financial care of the disabled individual that they support or care for. Planning is key Putting in place both disability and critical illness insurances for the caregiver is a proactive planning step that will help to ease financial concerns in the event that changes in the health of the caregiver make it necessary. Having these insurances in place is essential for the well being of the caregiver, but especially important in ensuring that financial resources are available for the well-being of the person with the disability should the caregiver become unable to continue providing care. Designating a beneficiary of a retirement plan, such as an Individual Retirement Account (IRA) is an important financial planning tool to help minimize both income taxes and potentially probate costs. For instance, taxes on retirement accounts can be deferred if these are transferred upon death to a surviving spouse. We believe proactive planning and professional advice go hand in hand. By working with a BMO financial professional who understands the importance of planning for individuals with disabilities, their caregivers and their families, Americans can develop a thoughtful financial plan and enjoy greater peace of mind.